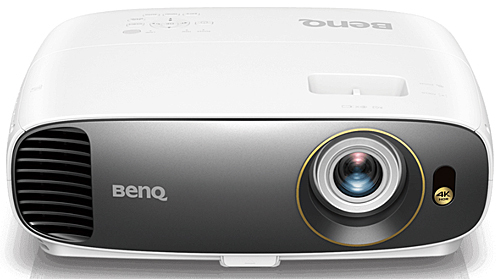 The BenQ HT 2550 is one of several new 4K projectors to hit the market in the last few months that is built around the 0.47" UHD DLP chipset and sells for less than $1,500. Unlike some of the other 4K projectors under $2,000, the HT2550 is 3D capable, although it needs to be put into a native 1080p mode for 3D display. But for those who have a collection of 3D discs in 1080p HD resolution, this is a welcome feature. Beyond 3D, the HT2550 has a few other handy features. It weighs under 10 lbs, so it is portable enough for backyard movie night or other transportable uses. It has a remarkably robust onboard speaker with impressive dynamic range that is surprising for its size--again, a nice feature for temporary backyard use. And it has keystone adjustment, a feature that is missing on several of its competitors. Brightness. The BenQ HT2550 is rated at 2,200 lumens. As is typical, this projector has an exceptionally bright factory calibration, called "Bright," that has a noticeably green bias. However, the green tint is within the range that many will still find usable for video on an occasional basis--in a family room during the day, for example, when you need the extra brightness to stand up to ambient light streaming through windows. It also has presets labeled Vivid TV, Cinema, Sport, and two custom adjustable User modes. If you pay an ISF-certified technician for calibration, you can also add ISF Day and ISF Night modes. The HT2550 has a Brilliant Color function, but unlike most implementations that can be adjusted on a scale of 1 to 10, this one is a simple On or Off. With Brilliant Color On, color brightness measures roughly 80% of white in all color modes. Turning it off reduces lumen output by about 20%, but also makes color brightness virtually 100% of white. There is no noticeable loss of color saturation--and no shift in hue or color brightness--when Brilliant Color is on, but large white elements in the scene can appear a bit overdriven, which can affect your perception of colors, often making them look darker. There is also an Economic lamp mode which reduces lumen output by 34% in the test unit with the new firmware. If you activate Economic and also turn Brilliant Color off, overall brightness is cut by roughly 47%. So there are a few options for setting brightness to where it is optimum for your particular set up. Note that our second test unit with the firmware upgrade measured quite similar light ouput to the the original sample for most color mode settings. Only the Bright Mode setting measured differently, coming in about 85% as bright as the original sample at full power. The trade off is that the Bright mode now has less of a green shift than in the unit as originally shipped, making it much more usable. SDR Picture Quality. When we tested the HT2550 early production unit, we noted a distinct blue shift with SDR pictures in Cinema mode with default settings, and found it necessary to tune the projector for warmer flesh tones. With the new firmware and default settings, Cinema mode now delivers a close match to a reference image, with only the very slightest blue shift remaining. A light turquoise car in a reference image that is already a lot closer to blue than green, for example, turns light blue on the HT2550 with Cinema mode default settings. Also, blues and greens are just a touch darker than the reference. And flesh tones with the default settings on the new sample now closely match the reference image. Without direct comparison to a reference image, familiar "memory" colors like grass and sky look fine, and colors in general appear accurate, well balanced, and normal. Turning off Brilliant Color gives an even closer match to a reference image overall. Should you wish to fine tune color beyond that, BenQ provides adjustments for all six primary and secondary colors--RGBCYM-allowing independent settings of hue, saturation, and gain for each, as well as Flesh Tone and Color Enhancer settings. The default setting for the Brightness control in Cinema mode is exactly right for a dark room and Contrast is arguably right as well, although after looking at images designed for setting contrast we ended up one click lower. With either setting, though, contrast is quite acceptably good, and the projector delivered a thoroughly enjoyable image that never seemed noticeably deficient in this regard. In most cases it is not quite up to the competition but the differences, by and large, are not drastic. With its 10,000:1 specification, the HT2550 is tied with several other models for lowest contrast rating among the 4K projectors in this price range. However, most of the higher ratings are based on dynamic contrast specs, while the HT2550's rating is based on a Full-On Full-Off measurement, and so is not unrealistically inflated. HDR Picture Quality. Color accuracy with HDR subject matter is similar to but not quite the same as with SDR. Flesh tones on HDR content may require some tuning, but can be greatly improved with a simple adjustment of the CinemaMaster Flesh Tone setting. Beyond this, the HDR picture is visibly higher in contrast than with SDR, as one would expect. No projector will or should be expected to deliver the extreme HDR contrast of flat panels, which is a good thing--front projection avoids the artificially over processed look that is common on flat panels. What you get on the HT2550 (after color adjustments) is an attractive high contrast HDR image that looks naturally balanced and not over processed. The HT2550 has brightness options for HDR in the menu. The default setting is 0, and you can change it to +1, +2, or -1 and -2 to increase or decrease image brightness. These adjustments do nothing to improve the overall HDR balance. BenQ says they are meant to let you compensate for issues related to your particular screen size and screen gain. As noted elsewhere, the quality and balance of HDR pictures on all video displays may vary based on the source due to the non-standardized HDR source material. With some HDR discs, color saturation can appear weak on the HT2550. So when it comes to HDR, the HT2550, like all HDR projectors we've tested thus far, typically benefits from a few quick tweaks to the basic contrast, brightness, and saturation controls to accommodate each individual disc. The good news is that you can get a well balanced HDR picture from each source as long as you're up for making some basic picture adjustments. 3D Performance. The fact that the HT2550 offers 3D at all puts it in an elite group as far as 4K (and 4K-enabled) projectors are concerned. There are only a few models priced at $2,000 or less to offer 3D at the moment, including the BenQ TK800 ($1,499), the Optoma UHD51A ($1,699), the Optoma UHD51ALV ($1,699), the Epson Home Cinema 4000 ($1,749), and the recently announced Epson Home Cinema 4010 4K PRO-UHD Projector ($2,000). The latter two are "4K enhanced" models that use pixel-shifting with 1080p 3LCD panels. Initial shipments of the HT2550 came with a malfunctioning 3D system that caused intermittent reversal of the sync. With the new firmware, however, there was no hint of the problem. If you happen to have one of the early units with this issue, contact BenQ for assistance as it needs to be sent to a BenQ service location for upgrade. Brightness Uniformity. The first HT2550 test unit we looked at measured 73% for uniformity at both extreme settings of its zoom lens. This is a number we arrive at by dividing the screen into nine segments--like a tic-tac-toe grid--and measuring brightness at the centermost point within each segment. We then calculate the brightness of the least bright measurement as a percentage of the brightest measurement to arrive at our figure for brightness uniformity. When the BenQ TK800--which is a near twin to the HT2550 but with a different color wheel--came in at 82%, we observed that the difference might be due to manufacturing variance. The new test unit for the HT2550, with the updated firmware, measured 66%, somewhat low in our experience for a home theater projector. BenQ says that the engineering spec for uniformity is 75% +/- 5% , which would put both the 82% for the TK800 and the 66% for the HT2550 out of spec--with the TK800 out of spec in a good way. However, according to BenQ, the company uses a different industry formula to measure brightness uniformity, one that minimizes manufacturing variances from unit to unit. When we apply that formula, using our measurements, we come up with a figure of just over 78%, well within BenQ's manufacturing spec. In any case, and however you calculate the uniformity, the observed shift in brightness with our sample was gradual and largely unnoticeable even with a solid white test pattern; with any normal viewing of program material it is essentially invisible. With the test pattern, one can see that the picture is brightest at the lower center and very gradually fades toward the upper corners, but with no detectable hotspot or dimmer areas in between. HDMI Bandwidth. This projector has two HDMI ports. The first is HDMI 2.0 / HDCP 2.2 compliant with a bandwidth of 18 Gbps. The second is HDMI 1.4a with bandwidth of 10.2 Gbps. Input Lag. The HT2550 measured 50 ms input lag. This is fine for most casual gaming, but serious or professional gamers will probably want a faster unit. Rainbow artifacts. Rainbows are visible very infrequently on most DLP home theater projectors these days, including the HT2550. However some people are uniquely sensitive to this artifact, and there is no way to predict whether you may be one of them. If you are uncertain, buy from a reseller with a friendly return policy so you can test it out yourself. Fan noise. BenQ has done a very good job with fan noise on this projector. The noise is audible in full lamp mode, but not at all excessive or objectionable in our opinion. Dropping the unit into Economic mode will render the fan very quiet with just a low buzz that you can detect in a silent room. Even in High Altitude mode, which is required at 1,500 meters elevation, fan noise is remarkably unobtrusive compared to a lot of projectors we've heard. And in High Altitude, dropping it into Economic mode renders it surprisingly quiet. On board Audio. The HT2550 has a single 5W speaker mounted on the side. However, the audio is louder and offers deeper bass than some claimed 20W speakers we've heard. If this is not the best audio we've ever gotten from a projector it is certainly close. This is particularly handy for backyard movies or other portable applications where you'd want sound on board. Lamp Life and Replacement Cost. BenQ is quoting 4,000 hours of lamp life in Full lamp mode, 10,000 hours in Economic mode, and 8,000 hours in SmartEco mode. A replacement lamp is $149. Focus. When we first tested the HT2550, we reported that our test sample did not allow perfect focus across the entire screen. This appears to be related to it being an early unit, which used a lens that BenQ says has since been upgraded. When we tested the BenQ TK800, which differs primarily in its color wheel and also has the upgraded version of the lens, it focused sharply from edge to edge across the screen. So did the new HT2550 test unit for this review. Nonetheless, be prepared to spend some time tuning the best possible focus, as small movements of the focus control can produce rather large effects on the screen. Once dialed in, though, you shouldn't need to touch it again unless you move the projector. Dark frame around image. This projector creates a very dark but not perfectly black frame around the projected image. The frame is about 4.5% of the picture width. So for a 120" diagonal image (105" in width), the projected dark frame is almost 5" wide around the entire active area of the 16:9 image. If you are projecting onto a screen with a black 3" wide frame, a bit of the projected dark frame will fall onto the wall around the screen. If the wall is white and you are in a dark viewing room this may be visible. So far, this is an artifact we notice on all of the projectors that have the 0.47" UHD DLP chip, so it is not unique to the HT2550. 3D Manual Settings. The BenQ HT2550 has 3D for 1080p sources only (not 4K). This is not unusual for UHD projectors as there is no 3D standard for 4K UHD Blu-rays. However, the projector will not automatically recognize a 3D source signal. You must go into the menu and turn 3D on in order for it to play properly. Once 3D is turned on, any subsequent 4K material being displayed will be projected in native 1080p until you go back into the menu to turn 3D off. 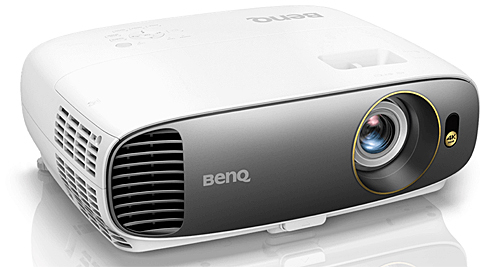 The BenQ HT2550 is an exciting projector simply because it is 4K resolution at $1,499, and especially because it also offers playback of 1080p 3D at its budget price. This combination of factors will put it high on the short list of many users who have an investment in 3D discs. However, there is more 4K competition with 3D than there was when we first reviewed the HT2550, including BenQ's own TK800, which means you'll need to compare other features as well. For those who have no interest in 3D, the value of the HT2550 is a question of trade-offs against the other 4K projectors selling at or near the same price point. ViewSonic and Optoma, in particular, have significantly stepped up their games with impressive products that include higher contrast and unique features of their own. With this sudden rush of inexpensive 4K models, BenQ is facing some inspired and determined competitors intent upon taking their own fair share of the home theater market. The result going forward will be more features and performance at lower prices across the board--a development we can all celebrate.